Excellence in clinical outcomes, efficiency in the supply chain and enhancement of the patient experience are the drivers behind developing medical facilities that meet healthcare needs now and in the future. Here is a guide to creating the optimum conditions for digitally-led patient care. Left to right: Authors Nils Bohlin, Ulrica Sehlstedt, Vikas Kharbanda and Johan Treutiger. In hospitals from Beijing to Boston, rising costs, a need to improve access to care, increasingly complex treatment options, and patients’ increasing involvement in the care delivery cycle are driving a new paradigm in healthcare delivery. While hospitals have spent the last decade investing heavily in technology to address these changes, many hospital managers struggle to set a clear vision for their long-term technology strategy. From the implementation of electronic medical records and patient data management to more complex systems integrating telemedicine systems, many hospitals’ IT focus has been on automation of existing operations and driving efficiency over the last decade. 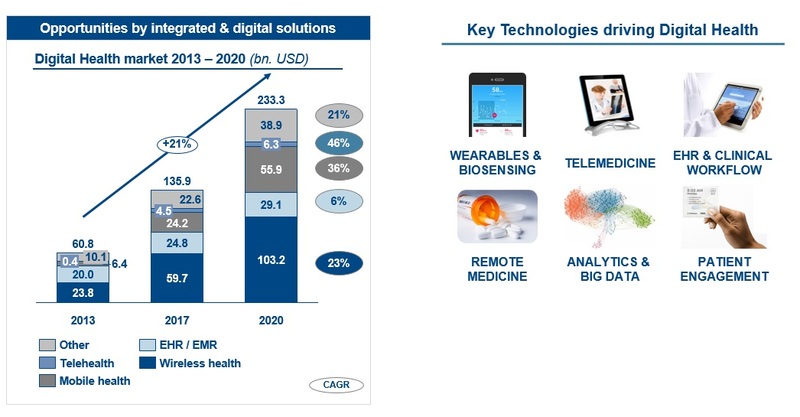 Investments in digitisation of the healthcare sector are expected to experience a year-on-year growth rate of more than 20%. With so much technology available, what is worthy of investment, and how can implementation be better coordinated to demonstrate improved clinical outcomes, patient safety, and operational efficiency as quickly as possible? A ‘smart hospital’ strategy will build a future-proofed facility that uniquely balances three key aspects – excellence in clinical outcome, efficiency in the supply chain and enhancement of the patient experience. 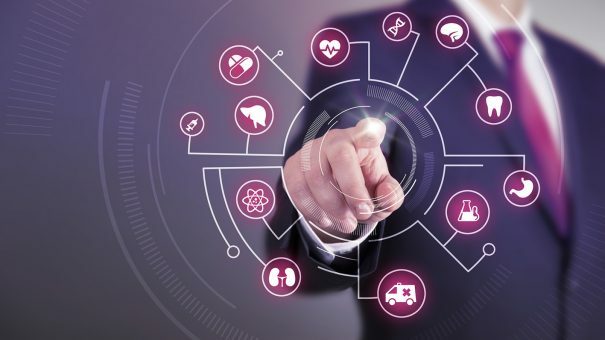 Building a smart hospital is more than bringing together connected devices on a high-speed networking infrastructure. It means rethinking the care processes, management systems, and even physical facilities to drive a new way of delivering care. This starts with the fundamental objective that every healthcare-delivery institution strives to achieve ‘excellence in healthcare delivery’. Hospital executives can define excellence along four key areas of patient care and institutional management. Systematically understanding what technology solutions will improve excellence in each area provides the blueprint executives need to set clear directions for their core IT investments. Patient services and interfaces: Smart hospitals demand a complete rethink of how patients use different services in the hospital. For instance, digital infrastructure and content management in the patient’s room could provide information related to their condition, procedure, medication and treatment. Kiosks in the outpatient section could support information dissemination, patient registration, and billing systems to reduce waiting times, and allow waiting areas to offer more medical services. Care processes and orchestration: Wearables, sensors and communication devices are transforming the way patients interact with providers. Not only can some care processes be shifted out of the hospital setting, but the multi-speciality, team-based care model can be facilitated across a network of hospitals. Video-streaming capabilities from surgical rooms can enhance training or give the clinician access to external expertise. Integrated patient data and live feeds from sensors in the patient room displayed centrally enable doctors to do ‘virtual’ rounds, improve the frequency of interaction between patients and doctors, and enhance processes and staffing requirements in nursing stations. Logistics and support services design: Technology that identifies and reports the location and utilisation of a hospital’s medical and non-medical resources can better orchestrate resources, reducing downtime of critical facilities, synchronising patients’ treatment schedules, and improving inventory management. For instance, hospitals that use RFID and Wireless LAN technology to track and disseminate consumables are minimising waste and realising major cost savings. Organisation and capability design: To fully leverage digital capabilities in the hospital setting, there needs to be adequate focus on people management and training. Both clinician and non-clinical staff need the training and skills to successfully implement new technology, meaning executives need to think through how the smart hospital transformation will affect management systems, governance, and technical competencies among its people. A strong governance model that brings together clinical and technical staff into cross functional collaboration remains one of the most critical enablers in ensuring technology strategy design and adoption in a provider institution. Commitment from the top: The whole organisation must commit to the smart hospital agenda. Institutions that simply ‘throw more IT’ at the ambition will achieve less than those that commit to a concerted organisational approach. The plan should be led by a single person responsible for managing the rollout. This cannot be a virtual function or one delivered by a committee, but a single role anchored in the organisational structure, with a clear mandate from the top. The smart hospital leader needs a seat at the executive table, an allocated budget, and clear targets linked to cost containment, revenue, and patient experience. 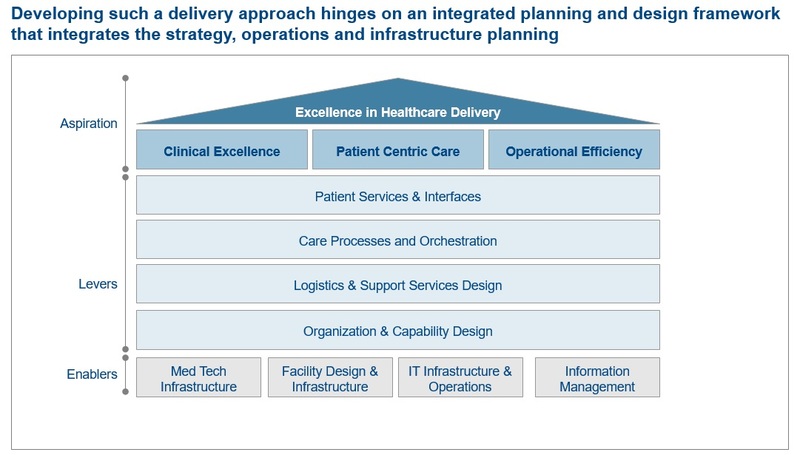 Rethinking the enterprise-architecture approach: With a fast-developing portfolio of innovative technologies that will have a fundamental impact on all aspects of the hospital’s services and operations, the blueprint needs a ‘campus’ approach to enterprise architecture, in which cross-functional teams are co-located, constantly reviewing the technology footprint, and scanning internal and external applications for technology. The mandate for this function would be not just to review and refine the technology blueprint, but to orchestrate the evaluation, adoption, and integration of technology in the hospital’s operations. Partnering, not just procuring: The pace of innovation in medical technology demands a more flexible, partner-focused approach to procurement. This does not mean doing away with existing efficiency standards but, rather, adding capabilities that allow procurement teams to create risk-shared, innovative approaches for working with a new breed of providers who are rapidly providing new and innovative health technologies. Creating a learning organisation: Establishing a culture that motivates hospital staff to constantly upskill their capabilities is critical, particularly for new technologies that change ways of working. Continuing professional development is already a clear requirement of clinical staff. The smart hospital agenda demands the system applies the same up-skilling mandates and systems to non-clinical staff. More than simply introducing automation and connected devices, a smart hospital strategy rethinks care processes, management systems, and even physical facilities, to drive a new way of delivering care. With this blueprint, hospital managers are equipped with the tools to deliver a successful transformation that meets cost, and patient care, objectives while allowing the organisation to adapt to a fast-changing landscape of medical science. The authors all work at Arthur D Little. Nils Bohlin is Global Practice Leader Healthcare, Nordics; Ulrica Sehlstedt is Partner, Healthcare, Nordics; Vikas Kharbanda is Pricipal, Healthcare, Middle East, and Johan Treutiger is Pricipal, Strategy & Organisation, Nordics.